I like these longer arcs. Thank you for being patient while I explore the space a bit. I never expected to find myself jealous of someone being possessed… That is so goddamn metal. If this were set in the Dragonball universe, the summoning would have been as was (a couple of pages), and the ensuing 3 minute battle over the next 140 pages, give or take 20. Saiyan Rage Baby should only cover 80’s music from John Hughes and Bratpack movies, but in their unique style. You know, I don’t think I’ve ever heard a player character utter that line. Players are usually very happy to fight unworthy foes. Yeah…from my experience as a GM, my players aren’t happy unless they are fighting a enemy that has no challenge, no secret abilities, no chance of beating them. I may need to find new games. I’d far rather have something that is a strugfle to fight, and requires some strategy. My literal only thing is that I prefer special abilities it has to make sense. But since 90% of the time that’s not an issue, it’s chill. But for me tbh, fights you get out of by the skin of your teeth are more memorable. Eh, I got a ratfolk gulch gunner who loves difficult enemies. He’s also psychotic… so there’s that. Why would we need to be patient at all, this arc has been amazing. This is exactly what I am here for! Keep it going! This is epic the purple power up looks so cool and the background eyes are amazing! 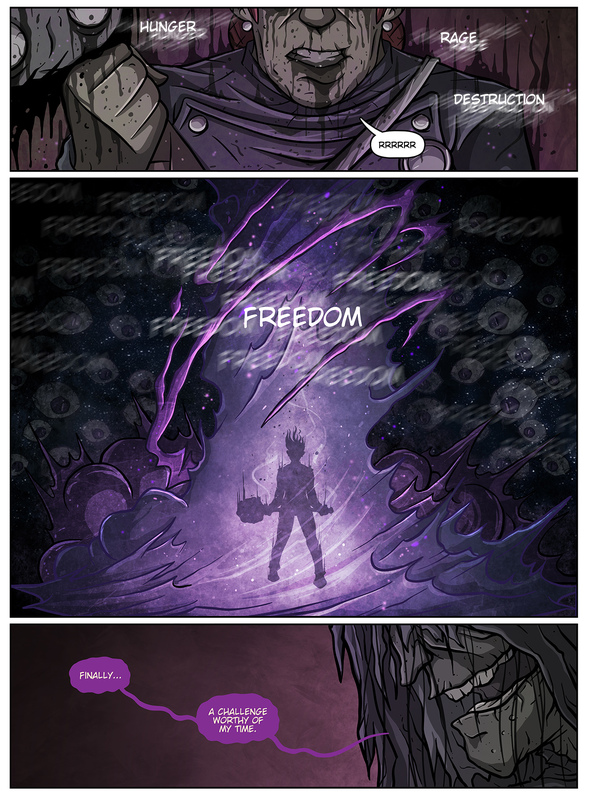 That purple “Freedom” page… Needs to be a poster..